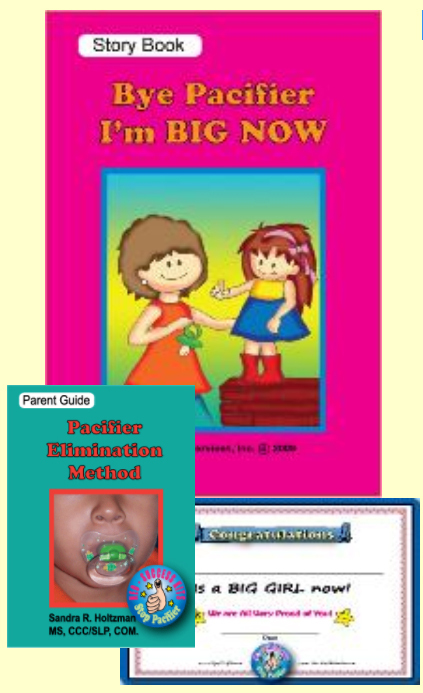 Bye Pacifier I'm BIG NOW is a book created by Sandra R. Holtzman to help kids quit the pacifier in a kind way. Holtzman’s method makes you the “helper” instead of the enemy. Nothing is negative and your child slowly adapts to doing without the pacifier. It is a win-win situation. The illustrated book comes with a little guide for parents to help children in this process. It includes a certificate to be given to the child at completion. You can choose the girl's version or the boy's. Important Information for parents regarding pacifier-sucking habits and successful methods to eliminate them.